The gospel message is a call to follow Christ, to be with him, and to hear his voice. “Come, follow me” is a personal invitation to spend time with him, to get to know him, and to love him. Insert your name in the gospel phrase this week: “N., come, follow me” and hear him call your name. Jesus calls me out of my comfort zone to set out with Him into deep waters. The deep waters are where I bring the gospel message into my workplace, school and social circles. 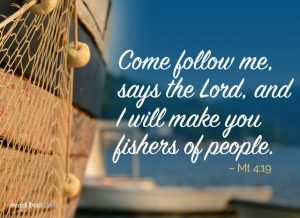 Ask Him how this week He will use me to be a fisher of people, and then boldly in His Name to cast the nets.